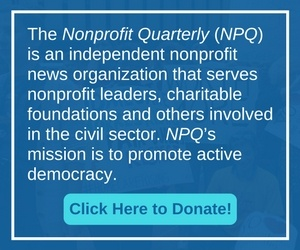 NPQ is reminded at times like these how critical nonprofit legal advocates are to preserving our civil and human rights. We remain impressed at their capacity to have cases ready to go in the face of an unpredictable presidency. We believe this message lays out the danger embedded in the moment more succinctly and powerfully than anything else. National writers’ organization PEN America has filed a lawsuit against President Donald Trump to enjoin him from using his office to retaliate against those who criticize him in public. Their lawsuit reflects the interdependent nature of civic institutions and the importance of upholding them. The publisher of the New York Times is pilloried as a representative of responsible journalism on the carnival ride of a dangerous and erratic, but now increasingly predictable, presidential tweet storm. Justice Kennedy Steps Down: Will Nonprofits Be on the Losing End of His Decision? While Democratic and Republican politicians fight political battles over when the nomination of Justice Kennedy’s replacement should or should not be considered, those who will be most affected by the result should know this is their decision, too. Political doublespeak reaches new heights as a legislator who promises the “most sweeping gun reform package in the nation’s history” indicates that his bill would preserve Americans’ “right” to buy and own assault weapons.